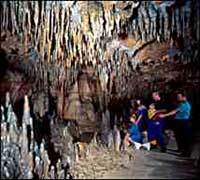 Florida Caverns takes its name from the beautiful Florida Cavern tour cave. Equal in beauty to such famous sites as Mammoth Cave and Carlsbad Caverns, the caves at Florida Caverns State Park contain dazzling formation of stalactites, stalagmites, soda straws, columns, rimstones, flowstones and draperies. These fragile formations are composed of calcite, a mineral dissolved from limestone rock when surface water containing carbonic acid percolates through the rock into the caves. As this mineral-charged water encounters the air inside the caves, layers of calcite are deposited. The creation of these stunning formations often take tens of thousands of years, and even the slightest disturbance by humans can destroy these delicate natural wonders. People also may adversely affect a variety of animals that visit or dwell within the caves. The endangered gray bat, found in some caves, is easily disturbed by human voices or lights. If awakened during the winter months, hibernating bats expend valuable energy which they otherwise need to survive. Caves inhabited by gray bats receive special legal protection under the federal Endangered Species Act of 1973. Florida Cavern is the only developed “tour cave” in the park. 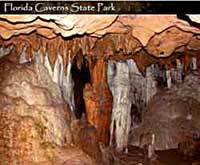 Florida Park Service permits are required to enter all other caves in the park. Some of the caves which require permits for entry are open for scientific research only. For the protection of the unique and sensitive resources which are found in these caves, visitors are asked to respect the off-limits status of these caves. 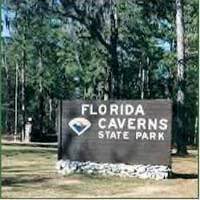 Although the caverns are the focal point of this Florida state park, the 1,300-acre grounds also boast a wide variety of plants, animals and other natural resources. American beech, Southern Magnolia, white oak and dogwood trees are prominent throughout the park, along with a number of plants that are also found in the southern Appalachian Mountains of north Georgia. During your visit, be sure to look for such wildflowers as the Atamasco Lily that starts blooming in January, and the Lyre-leaf Sage which flowers in March. Culumbine and Mayapple also make their appearance in March. Yellow Leafcup dazzles the eye in June and the Cardinal Flower displays until frost. Woodpeckers, barred owls, beavers, alligators, rare Barbour’s map turtles and alligator snapping turtles also inhabit the area. The scenic Chipola River is a favorite spot for picnicking, camping, fishing, swimming and canoeing. Hiking and horseback riding trails are available. Equestrian facilities, group and individual campsites, shower and restroom facilities are nearby. Guided cavern tours and an audio-visual program are offered to interpret the caverns and other natural features of the park.